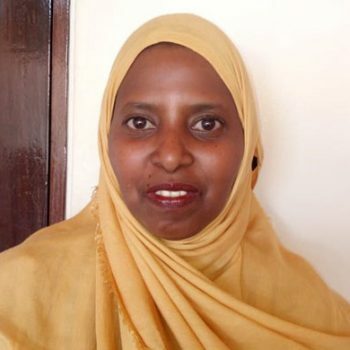 In the last 16 years, Dr. Ali has taught, trained, published and consulted in the field of International Relations, Peace, Security, Gender, Countering Violent Extremism (CVE), Social Development and has reviewed proposed University Curriculum for accreditation. She has been involved in program learning outcomes assessment, acted as an external examiner, taught graduate and post-graduate programs, supervised graduate and post-graduate students locally and internationally. Dr. Ahmed Ali has facilitated training for regional diplomats in East Africa, District Officers and Police Officers in both Kenya and Spain. Also, she has professionally worked with International NGOs, Chemonics Kenya Transition Initiative (KTI), Mercy Corps, Marie Stopes International, African Council of Religious Leaders (ACRL)-Religions for Peace, UN agencies (UNDP and UNHCR), Kenyan Government (Foreign Service Institute, Ministry of Foreign Affairs, Ministry of State for Provincial Administration and Internal Security and National Steering Committee on Peace Building and Conflict Management) and the Commission for University Education (CUE). Other professional experiences include: Visiting Faculty and an External researcher of the Interuniversity Institute for Social Development & Peace (IUDESP) of the Universitat Jaume I, Castellón, Spain, Co-director of Care Highway International projects in Kenya, security expert assistant for the European Union Election Observation Mission, student’s coordinator at Universitat, Jaume I, Castellón, Spain, primary school teacher, project coordinator and librarian. Dr Ahmed Ali has served as an International Observer of Development and Educational projects of SMARA (a local NGO in Castellón, Spain) and the Universitat Jaume I, Castellón, Spain in Saharawi Refugee camps in Tinduf, Algeria. She is also a Board member of the NGO Coalition of Violence Against Women (COVAW). She is an academic activist in the area of Violence against Women and has publication both in Spanish and English.